With FaceTime Audio, the iPhone can now make free VOIP (Voice Over Internet Protocol) calls directly from the built-in phone or FaceTime app, without the need for any third party services or applications. This basically means you make phone calls to anywhere in the world for free, so long as the recipient of the call is also using an iPhone, iPad, Mac, or iPod touch, and are running a modern version of iOS that supports FaceTime Audio. The audio call quality of FaceTime Audio is impressively clear and sounds much better than a standard cellular connection anyway, so even if you’re not looking to use this service as a long distance replacement, it can offer a significant improvement to general phone conversations as well. The actual FaceTime Audio screen looks a lot like a standard phone call, it will ring the contact as usual, and there are options and conveniences from normal voice calls available, like mute, speaker mode, and the ability to switch to a video chat if desired. 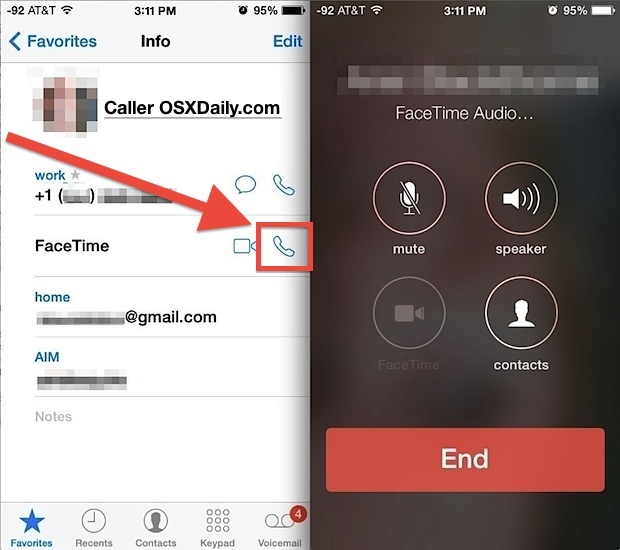 You can also initiate a FaceTime Audio call directly from the FaceTime app itself, though the dedicated app prefers video, so just be sure to tap on the phone icon rather than the video camera icon to start a voice conversation. Starting a FaceTime Audio call from FaceTime app is how you would do so on an iPad, as well. FaceTime Audio is really best used on wi-fi networks or unlimited data connections with LTE or 4G, though it will also work on bandwidth capped data plans. If you do use the feature over cellular data and don’t have unlimited bandwidth, pay attention to how long the conversation lasts and how much data you are using with the VOIP call, as the facetime audio connection stream will use a sizable amount of bandwidth and you may find yourself chewing through a standard data plan rather quickly. Just remember to keep an eye on data use, and whenever possible, switch to a wi-fi network to offload the data transfer to wi-fi and away from a cellular connection. 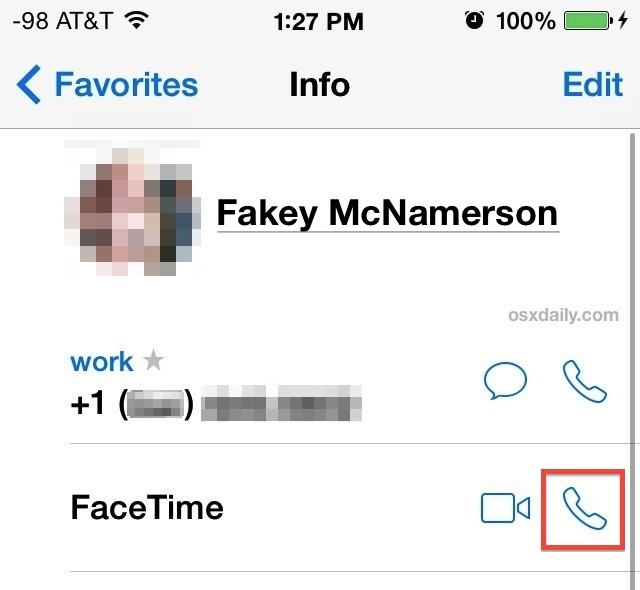 If you’re trying to use FaceTime and run into activation errors, it’s usually a quick fix. FaceTime Audio can be used to make voice calls directly between iPhones, iPads, iPod touches, and Macs running Mac OS X Mavericks or newer. Third party apps like Skype and Google Voice also offer VOIP and audio calling features across platforms, but while both are great services, each of those require downloading and using a third party service, which may give FaceTime Audio the edge for most iOS users. Though FaceTime Audio is officially available only in iOS 7.0 and newer releases, there are workarounds for prior versions to force voice-only FaceTime for both iOS and Macs if the need arrises. FaceTime Audio can be thought of kind of like iMessage for voice, in that Apple has built a service that circumvents the cellular carriers standard services which prevents cellular providers for charging users for long distance phone calls, or any phone calls for that matter. Combine that with the sound quality being far superior to a standard cell phone or analog line conversation, and FaceTime Audio really is a truly fantastic feature. Yeah but how do you initiate a call from OS X? Described method works on idevices iPhone 4s and above. For iPhone 4 you still need to be connected to wifi before initiating FaceTime Audio call. What’s funny is that a lot of data planes are capped. So it’s almost saying, ‘Make free calls from your cost option data plan’. It really is great when you’re on wifi but as the previous poster mentioned it’s actually moving calls off the voice plan, which is usually unlimited nowadays anyway, to data which is very often not. So in this case I don’t think they mind, unlike iMessage which cuts at a profit center in text messaging. Speak for yourself. Not all plans are the same around the world. Free call on VOIP is useful information.